Be good to your Hair! Having trouble figuring out a gift for a loved one? Give them a gift they can enjoy everyday.... A great Color or Highlights and Haircut! Curl Revitalizing Spray for a little on the go natural wave! Simply rub the product between your hands and rake fingers through dry hair for full voluminous strands and all-over texture. For a root lift, apply the product directly onto the root line and massage for lift and volume as well as refreshed clean looking hair. Just a little sprinkle gives you a lot of lift. The powder attaches to your hair strands coating them with a negative charge, creating “ionic repulsion” and leaving you with full voluminous hair and a natural feeling scalp with a matte finish. 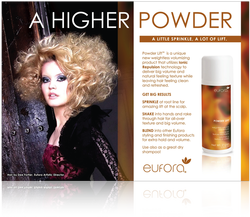 Powder Lift™ is made with Eufora’s signature Certified Organic Aloe Vera and a unique ionic repulsion technology that turns liquid into powder then back into liquid during use and also acts as a dry shampoo as it absorbs excessive oil. It’s a powder that’s actually 90 percent liquid. Did your hair have a little too much fun in the sun this summer? Repair it during the winter! This kit includes an Urgent Repair Shampoo which helps detoxify the hair and scalp, Removes impurities WITHOUT removing your color and just plainly feels refreshing!! Then follow with an awesome protien treatment afterwards to help start building that strength back in your hair! Has keratin to build the strength without making the hair brittle and menthol and camphor to calm the scalp! Get strength, shine and beautful hair all in one! 3. Buy 3 or more products (Hair Care or Skin Care) and get 30% OFF your total price! 5. Schedule a haircut, color or both and get a FREE eyebrow wax or 10 % off any product! Get a cut and color service and recieve a FREE make-up application. 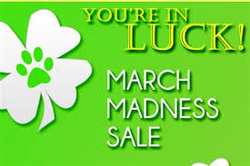 AND...because your so lucky this sale will be extended through end of April!